Lakewood is a city of over 58,000 people, making it the 17th largest in Washington state. Located in Pierce County, it is centrally located between Seattle-Tacoma and the state capital of Olympia. Once a comunity of Tacoma, the city has a distinct mix of urban and suburban living areas; homes for sale here may be older than the average home in Washington, but commute times are quite low for the area at just 24 minutes. 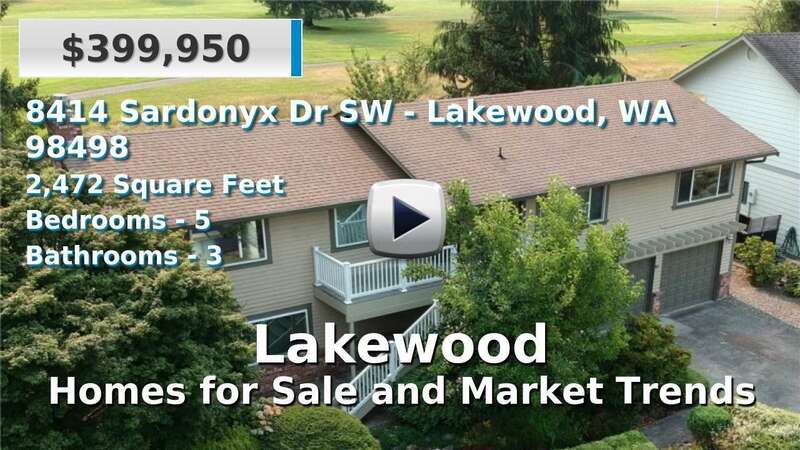 Living up to its name, many homes or condos for sale in Lakewood may offer residents a waterfront view of one of its many lakes or the Puget Sound. The city is well known for Joint Base Lewis-McChord, a major West Coast Army-Air Force base; Fort Steilacoom Park which features a large off-leash dog park, children’s playgrounds, athletic fields, and a living history museum; and Lakewold Gardens, a popular tourist attraction. Lakewood is also known locally for its lake fishing, especially in larger lakes such as American Lake, Lake Steilacoom, and Gravelly Lake. 5 Beds | 3 Baths | 3168 sq. Ft.
4 Beds | 2.5 Baths | 2522 sq. Ft.
4 Beds | 2 Baths | 1370 sq. Ft.
3 Beds | 1.5 Baths | 1404 sq. Ft.
3 Beds | 1.75 Baths | 1996 sq. Ft.
4 Beds | 2.25 Baths | 3400 sq. Ft.
5 Beds | 2.5 Baths | 2396 sq. Ft.
3 Beds | 2 Baths | 2288 sq. Ft.
4 Beds | 2.5 Baths | 1971 sq. Ft.
4 Beds | 2.5 Baths | 1932 sq. Ft.
4 Beds | 2.5 Baths | 1911 sq. Ft.
3 Beds | 2.25 Baths | 1674 sq. Ft.
2 Beds | 1.75 Baths | 917 sq. Ft.
4 Beds | 2.5 Baths | 2738 sq. Ft.
4 Beds | 2 Baths | 1152 sq. Ft.